PSALMS 27:7 KJV "Hear, O LORD, [when] I cry with my voice: have mercy also upon me, and answer me." 4One thing have I desired of the LORD, that will I seek after; that I may dwell in the house of the LORD all the days of my life, to behold the beauty of the LORD, and to enquire in his temple. 5For in the time of trouble he shall hide me in his pavilion: in the secret of his tabernacle shall he hide me; he shall set me up upon a rock. 6And now shall mine head be lifted up above mine enemies round about me: therefore will I offer in his tabernacle sacrifices of joy; I will sing, yea, I will sing praises unto the LORD. 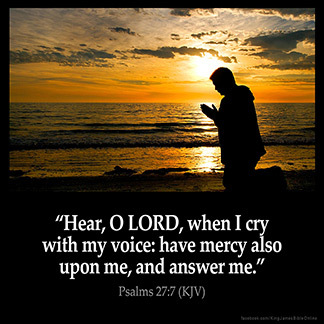 7Hear, O LORD, when I cry with my voice: have mercy also upon me, and answer me. 8When thou saidst, Seek ye my face; my heart said unto thee, Thy face, LORD, will I seek. 9Hide not thy face far from me; put not thy servant away in anger: thou hast been my help; leave me not, neither forsake me, O God of my salvation. 10When my father and my mother forsake me, then the LORD will take me up. Heare, O Lord, when I crie with my voice: haue mercie also vpon mee, and answere me. O Lord, let the voice of my cry come to your ears: have mercy on me, and give me an answer. Hear, Jehovah; with my voice do I call; be gracious unto me, and answer me. Hear, Yahweh, when I cry with my voice. Have mercy also on me, and answer me. Hear, O Jehovah, my voice -- I call, And favour me, and answer me. Hear, O LORD, when I call with my voice, and be gracious unto me, and answer me.